Live chat is a type of online chat distinguished by its simplicity and user accessibility. Live chat appears in a web browser or in mobile applications, usually via a small pop-up modal through which the visitor can exchange text messages with a chat operator in real time. Similar in function to other instant messaging chat clients that handle 1:1 communication, live chat doesn’t require that your visitors install any special software as the chat client lives within your website’s ecosystem. There’s nothing for your visitors to maintain or manage - they can start talking with a representative immediately. Depending on the specific use case, either a support representative will reach out to a user to see if they need help with anything or a person visiting the website or application will initiate the chat and the appropriate agent will join the conversation. Live chat typically does more than just allow two users to send messages to each other instantly. Robust live chat systems include typing indicators, chat history, read receipts, and integration into third-party software (e.g. ticketing support issues, collecting and analyzing data, or routing customers to the most appropriate representative), all of which improve the chat experience for both the agent and the customer. While we often think of live chat as a tool for websites, it is also widespread in mobile applications. One of the most dynamic ways to connect with users, live chat is now an integral part of many companies’ customer support process. Live chat is faster than email and is far more efficient than phone support. An experienced customer service representative can field multiple chat instances at a time. Incorporating automated greetings and responses both decreases the amount of work repetitive work a CS agent has to do and provides instant contact for the user who needs help. Not only does live chat improve customer service efficiency and efficacy, but it also can give an organization insight into customer habits, trends, and pain points. Marketing, sales, and customer support teams can analyze the efficacy of their support team, and even extract data to aid business intelligence efforts. Insight is likewise more easily available to customer service agents using live chat. Because live chat is built into the website or application it serves, a good chat client will provide the customer service agent visibility about the user who needs help, e.g. how long they’ve been on the site, if they are a new or returning user, or how many others are waiting to chat. 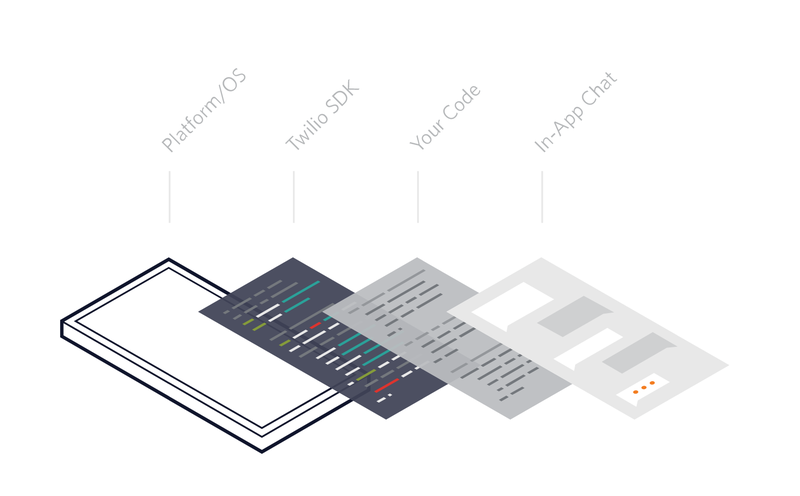 You can add full-featured live chat into any application on mobile or web with Twilio Programmable Chat which offers full-featured SDKs and global real-time messaging infrastructure. If you’re just getting started, check out this blog post on adding live support chat to your web application or watch this video!